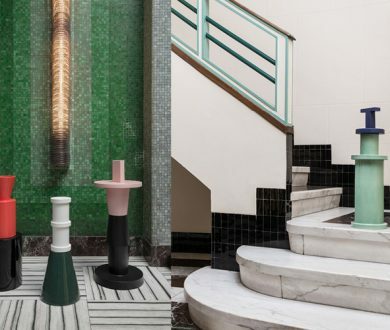 The most important event on any design aficionado’s calendar, the Salone del Mobile — part of Milan Design Week — is back and is promising more than ever before. 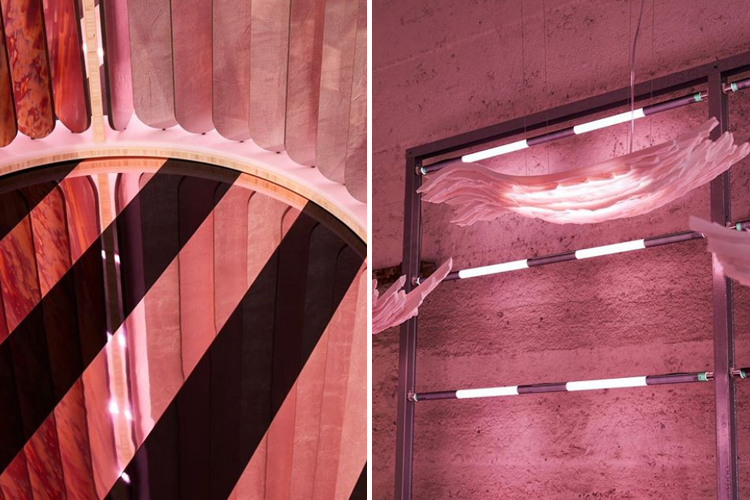 Officially kicking off today, disciples from all around the world have descended upon the style capital for a week of mind-bending exhibitions showcasing the latest and greatest in innovative and groundbreaking design. 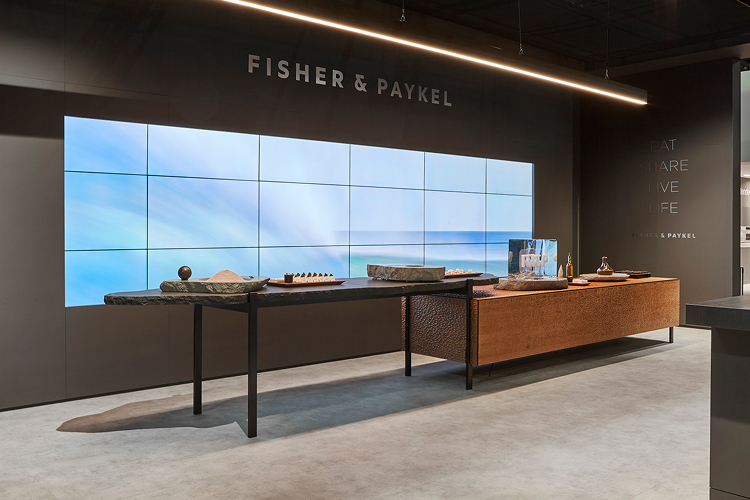 Left: The Showroom collection is a spatial translation of Mag Engeler’s feel for colour, texture and composition, offering a series of coffee tables a room divider and wall furniture. 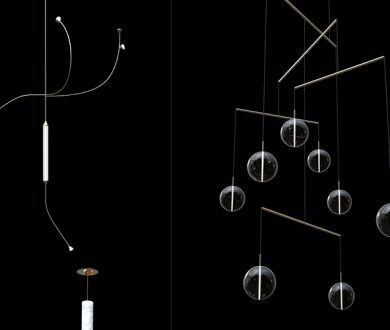 Right: Crystal Shift & Twist saw Floris Wubben presents a collection of unique lighting objects. 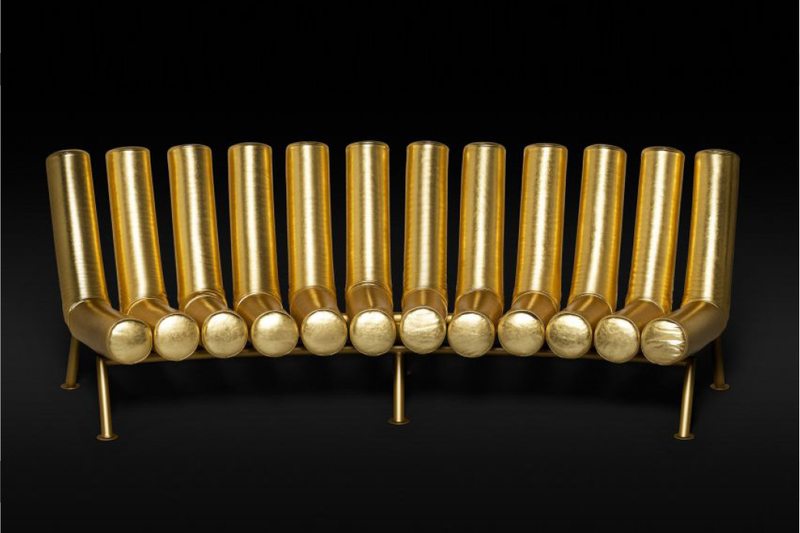 Crystal Shift consists of wavy lines where Crystal Twist comprises spiral shapes. 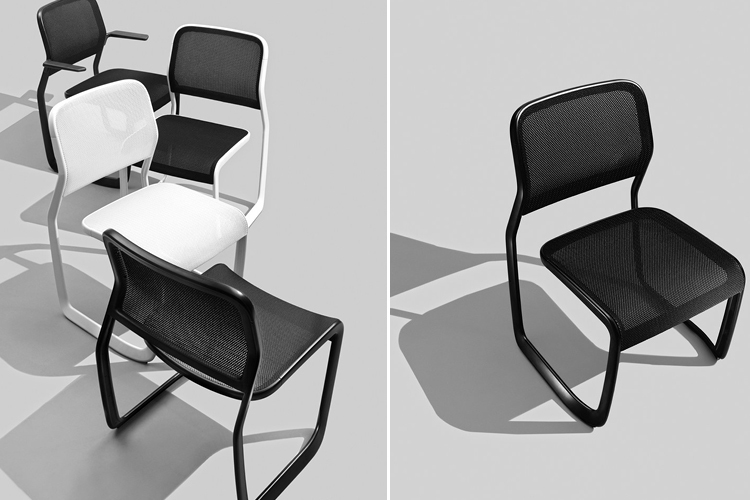 Reflecting Newson’s fascination with the space age, these chairs are futuristic and honour the cantilevered chairs of Mies van der Rohe. 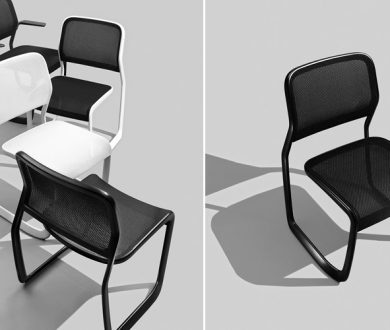 Made to celebrate Knoll’s 80th anniversary, these chairs were designed to reflect the aesthetic principles that inform all of Knoll’s current portfolio and combine simplicity, material, and precision. 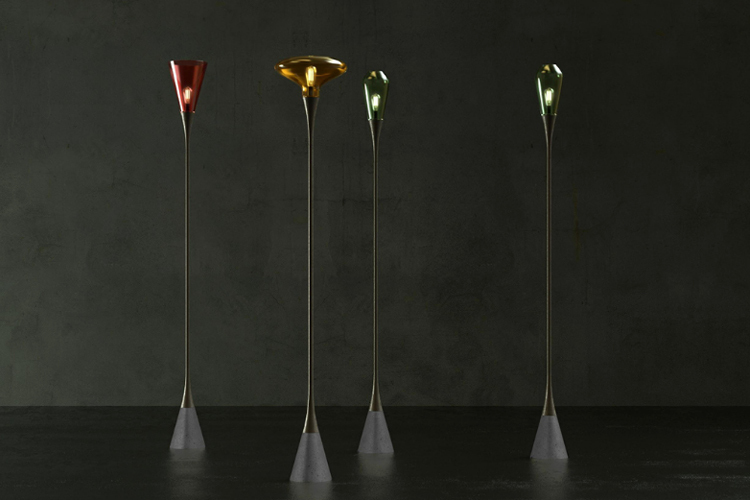 Unveiled this week as part of a local design initiative to coincide with Milan Design Week, Australian furniture icons King Living and Charles Wilson have teamed up to create a series of three standing lamps. 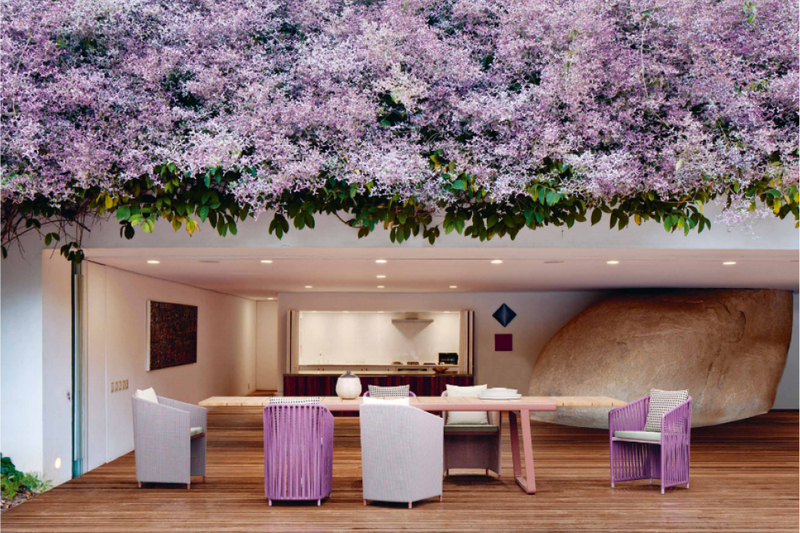 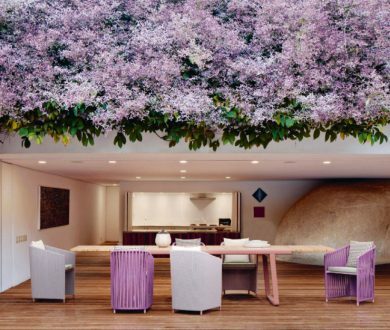 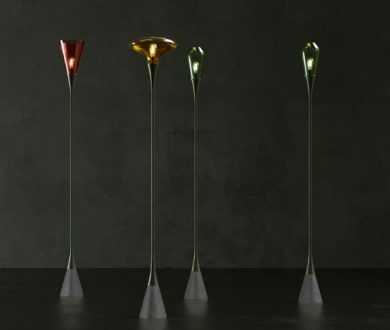 Designed to resemble giant, plant-like forms with hand-blown glass heads, the collaboration combines contemporary design with cutting-edge technology. 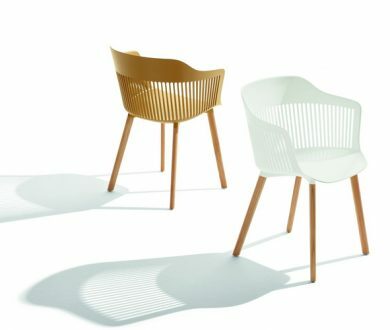 A collection that consists of three chairs, Starck combines a wooden mould with a plastic base and legs, available in various finishes including ‘Ash’, ‘Striped Rosewood’ and ‘Princesswood’. 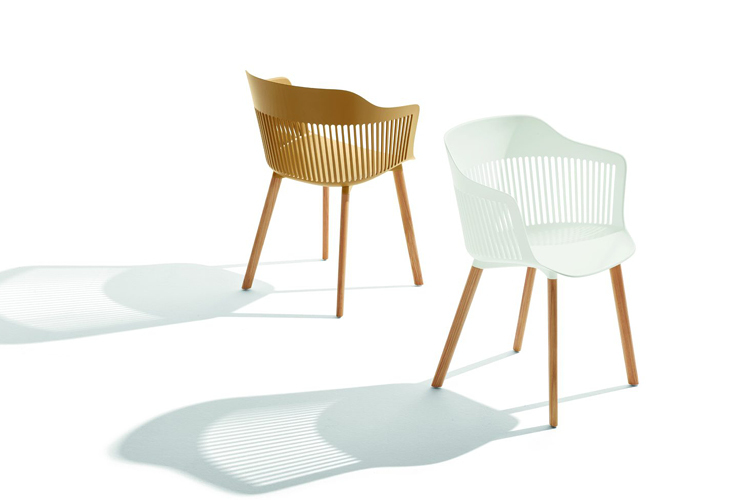 The collection marks 30 years since the designer challenged the use of materials at Kartell. 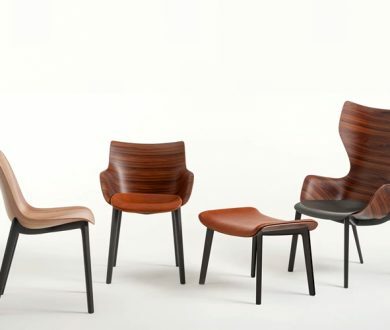 Softly curved, and understatedly elegant, these pieces are made to fit seamlessly into any home. 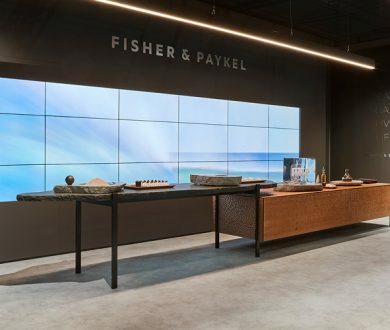 Fisher & Paykel presented their Hero Kitchen featuring a material palette of bronze patina on brass sheet metal, with an Atlantic granite bench and European Oak on the refrigeration wall units. 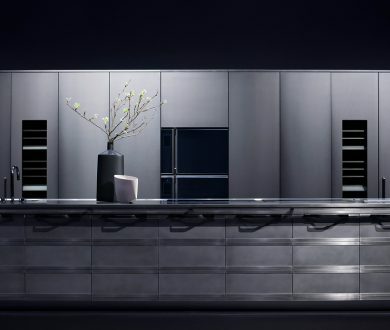 They also presented a new 24-inch column refrigerator and freezer as well as a cooking wall that offered new, built-in ovens, combi steam and microwave ovens. 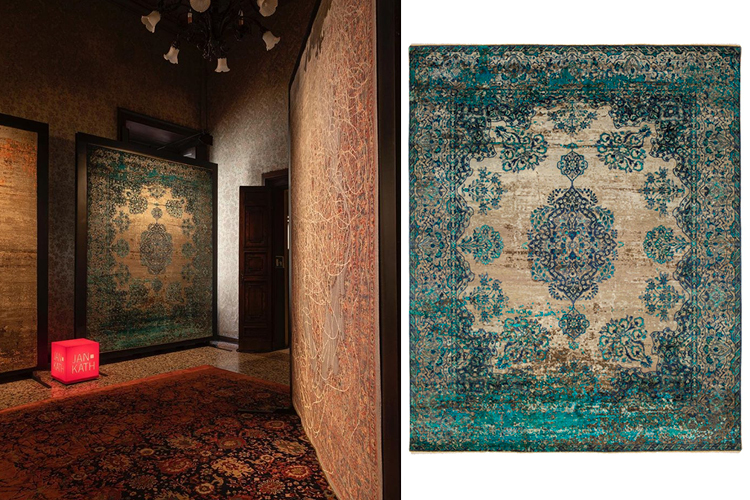 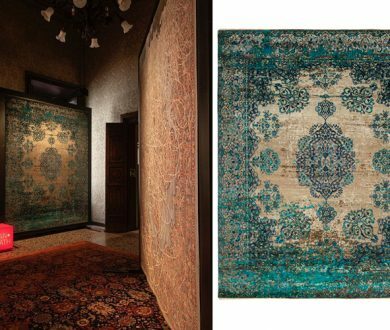 Showing as part of the DAMN multi-designer show at Palazzo Litta, Jan Kath exhibited his incredibly detailed and breathtakingly beautiful rugs like the pieces of art they are. 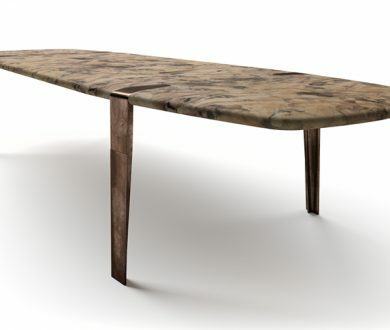 This organically shaped piece features a large, handmade briar-root mosaic top and stands on antiqued cast bronze legs that meld seamlessly into the table-top. 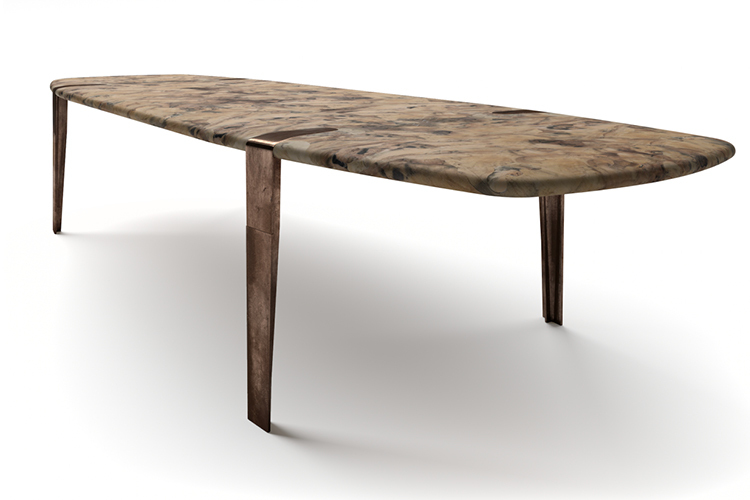 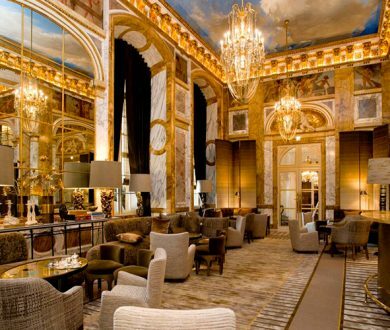 Earthy and bold, it garners attention while remaining inherently understated. 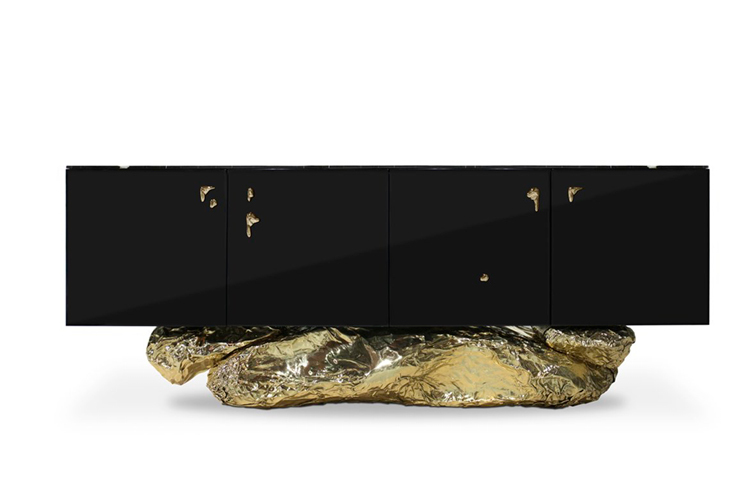 Paying tribute to the historical city of ‘Angara do Heroismo’, this luxurious sideboard by Boca Do Lobo features elegant, high-gloss cabinetry atop a uniquely sculptural base. 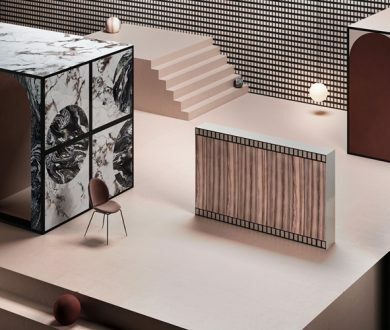 The new offerings from e15 play with defined, geometric forms and bold, material combinations such as unfilled travertines, honed marble and solid wood surfaces atop blackened steel and zinc galvanised steel frames. 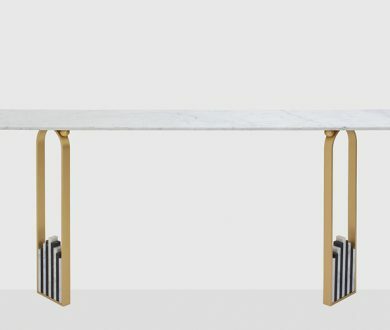 The two tables work together seamlessly to create a multi-dimensional feature, suitable for any living space. 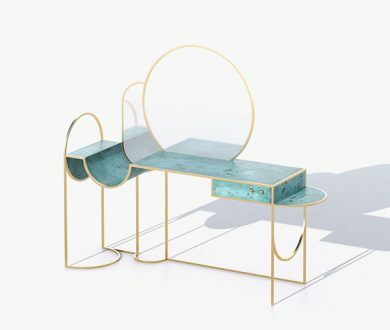 Designer Lara Bohinc takes the idea of a console and reimagines it in highly geometric form for this Celeste piece. 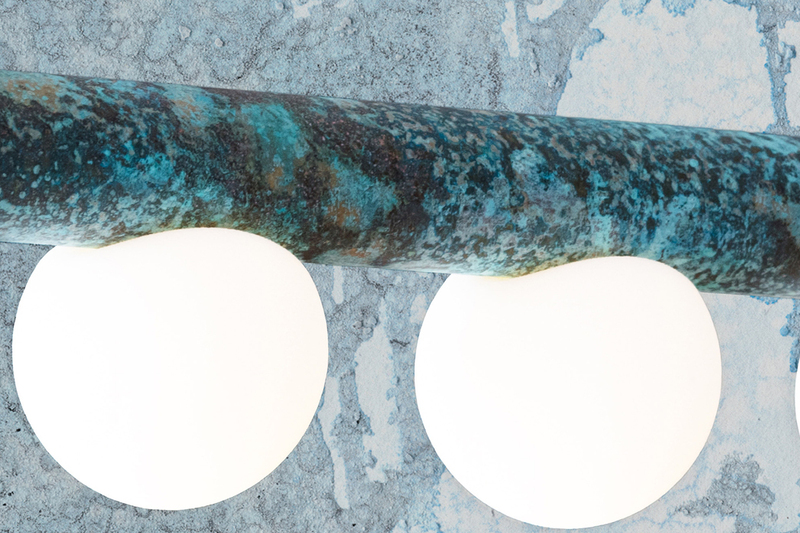 Part of her exhibition, Alcova, Bohinc utilises brass, galvanised steel and blue verdigris to create incredibly sculptural and original works. 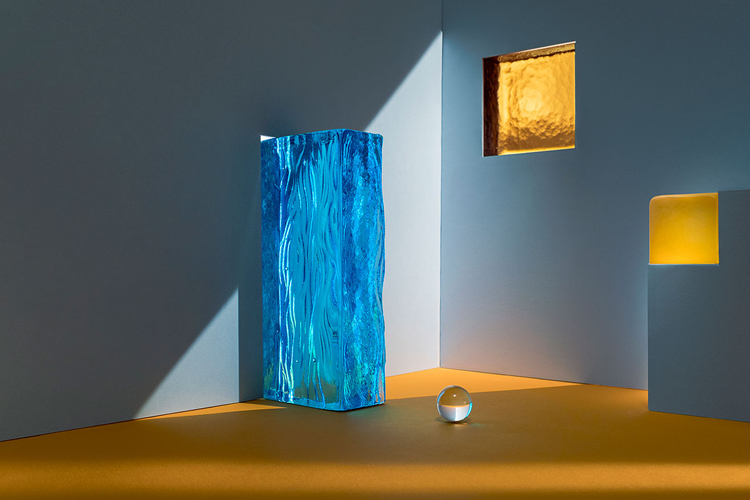 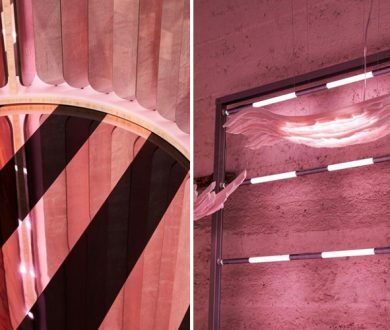 Hosting collections by Ronan and Erwan Bouroullec and Fornasetti, Wonderglass has created a luminescent installation that explores the capabilities of glass in architecture and the urban environment. 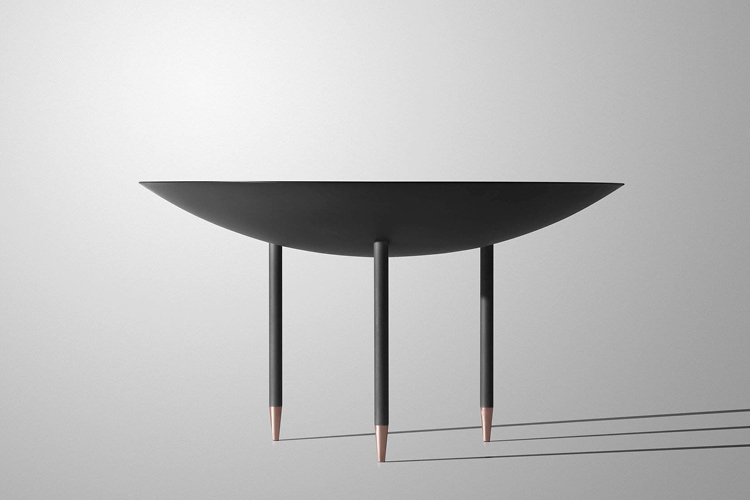 Fred Ganim takes his fascination with curvature to another level with his Plane Table. 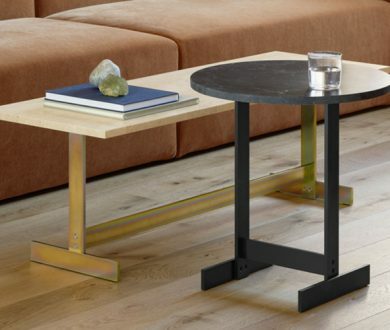 An eminently unique take on the traditional idea of a coffee table, this elegant piece is both understated and eye-catching. 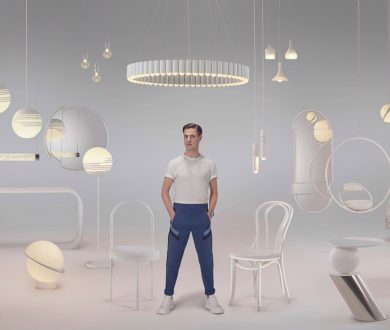 Composed of “Y” shaped arms that are arranged on two levels, this lamp is a luminescent sculpture. 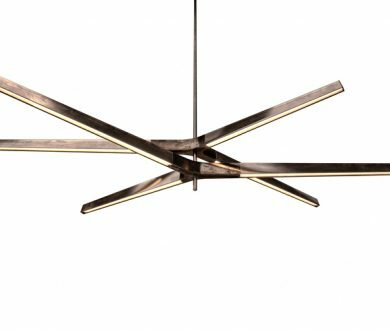 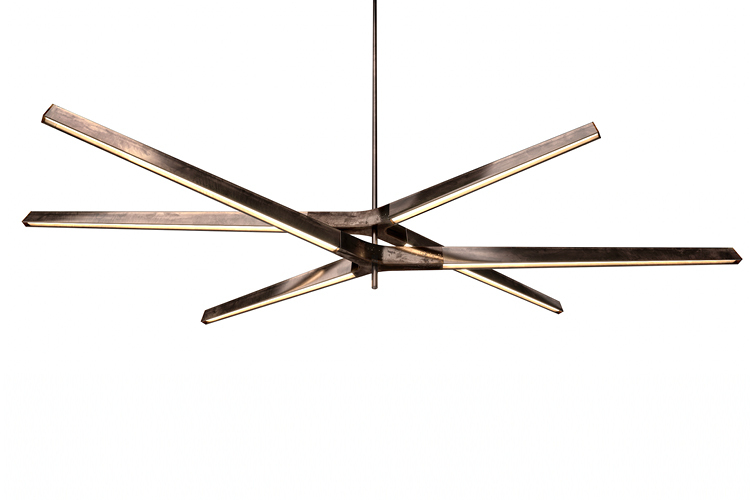 Available also in a chandelier version, the lamp is finished in either black burnished brass or bronze sand casting. 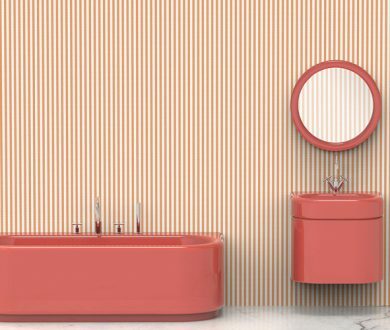 The Paris-based designer was invited by Bisazza to create a new candy-hued bathroom range that includes a bathtub, basin and mirror, plus a candy-striped mosaic patterned tile. 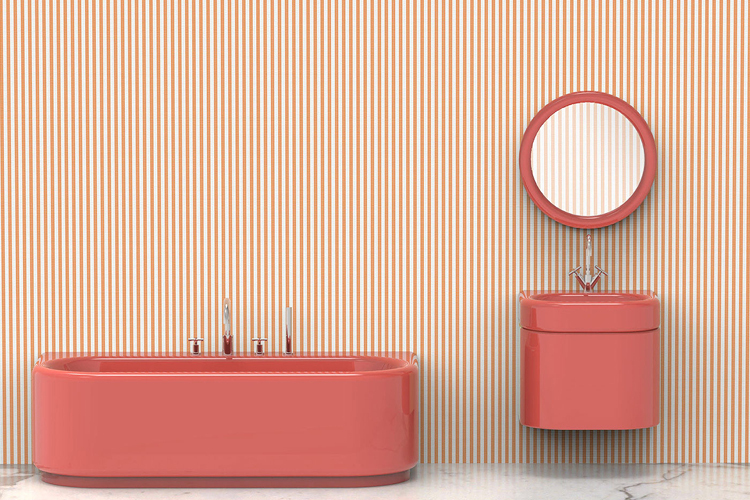 The result is an ambiguous retro vibe that Wes Anderson would be proud of. 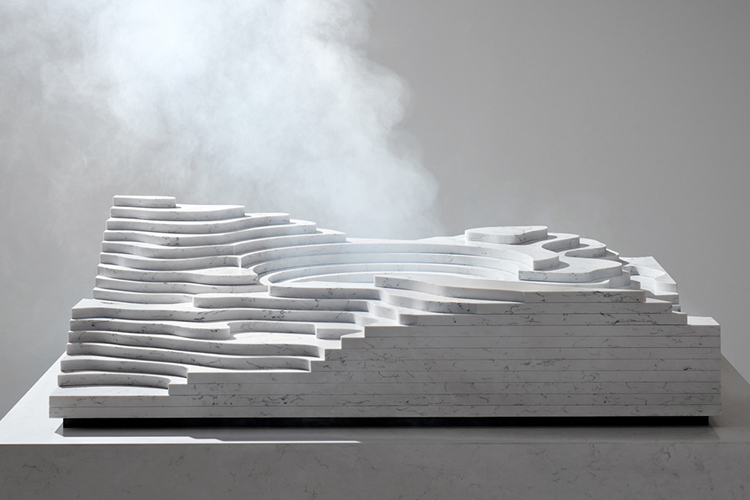 Snarkitecture’s Alex Mustonen, Daniel Arsham, and Ben Porto created this concept kitchen island installation as a space of changing elemental states — ice, water, and steam. 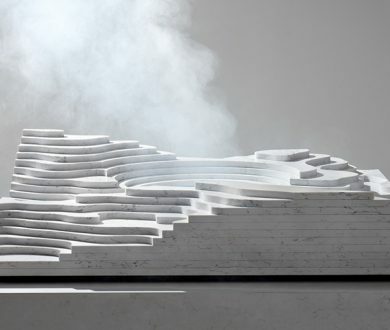 It sees four islands composed of layers of stacked, sinuously-shaped Caesarstone slabs, rendered to appear like rivers, glaciers and other natural features. 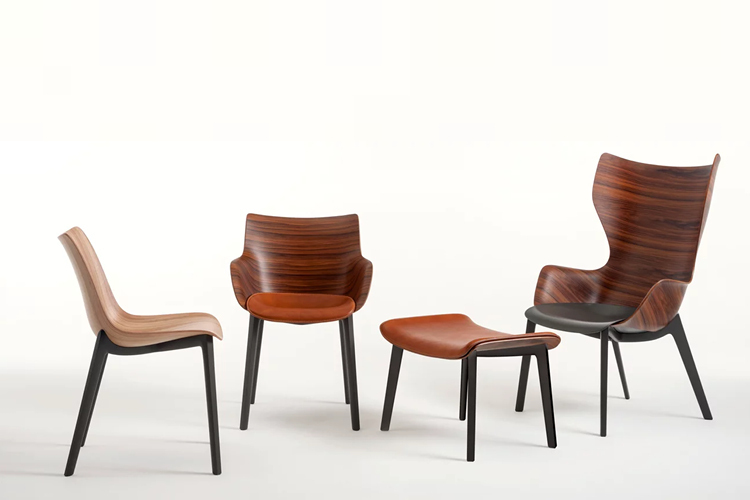 Vilhelm Wolhort’s iconic midcentury designs have been pivotal in the development of furniture design as we know it today. 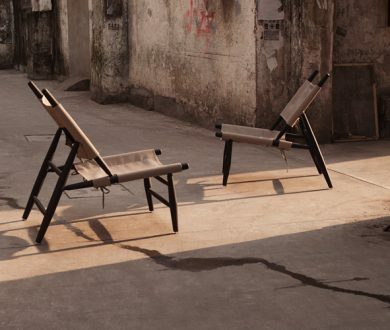 Stellar Works are breathing new life into his renowned pieces, like this Triangle Chair — effortlessly elegant and designed with ultimate comfort in mind. 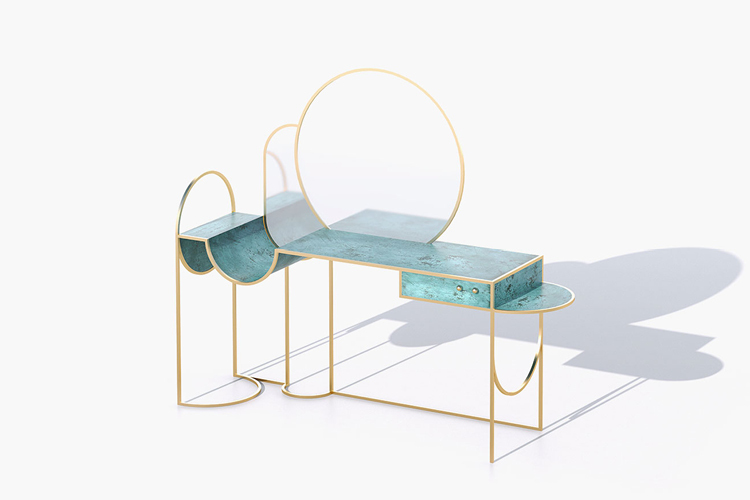 Below the Heaves is a furniture collection that explores the tension between strength and delicacy. 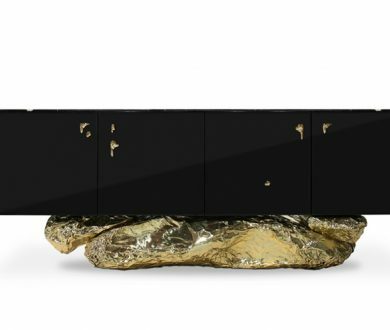 Sculptural, handcrafted furniture taps into mythology and spirituality where softness is juxtaposed against hard lines in a thoughtful and surprising way. 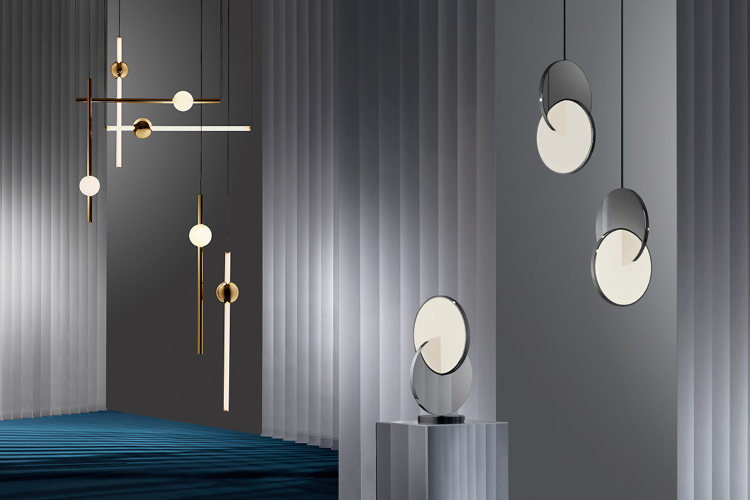 Playing with the idea of celestial luminescence, Lee Broom has returned to Milan Design Week with the first of a three-phase lighting collection — dubbed his most innovative to date. 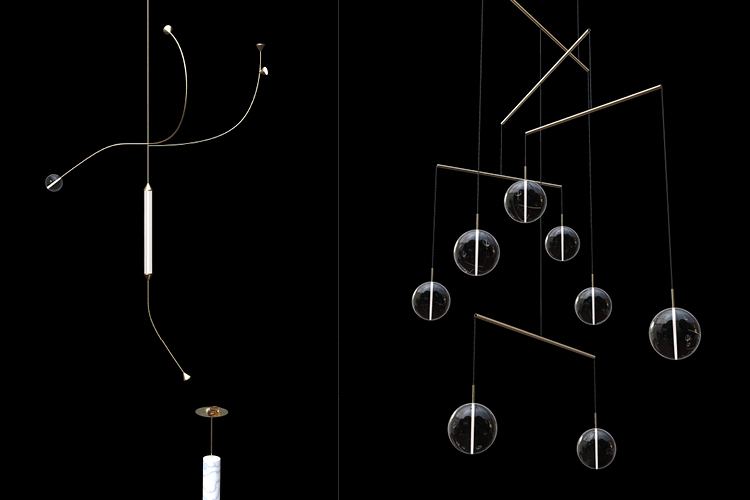 Spherical and cylindrical, the sculptural pieces offer a unique take on the chandelier. 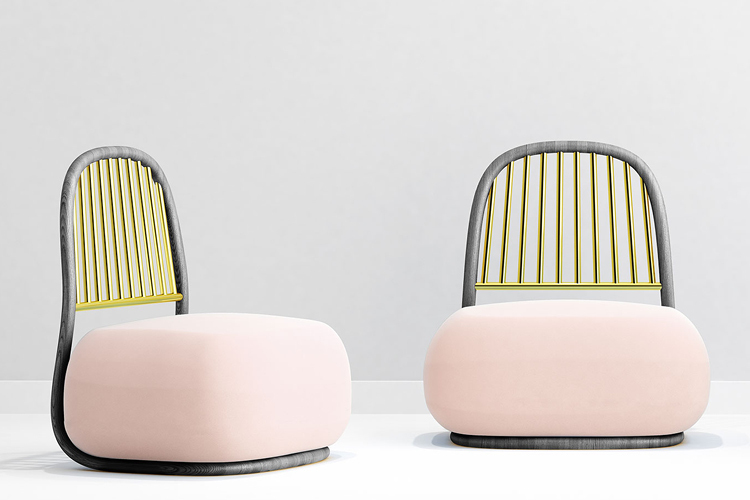 British design firm Established & Sons have teamed up with a number of designers to bring their small but considered collection for Milan Design Week to fruition. 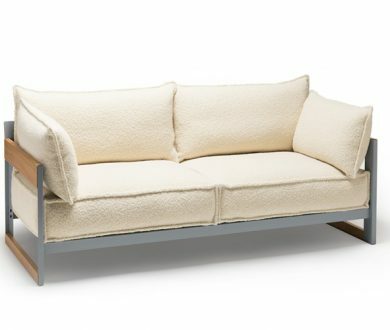 This Cassette sofa was the result of a collaboration with the Bouroullec brothers and is both luxurious and practical — it can be flat packed. 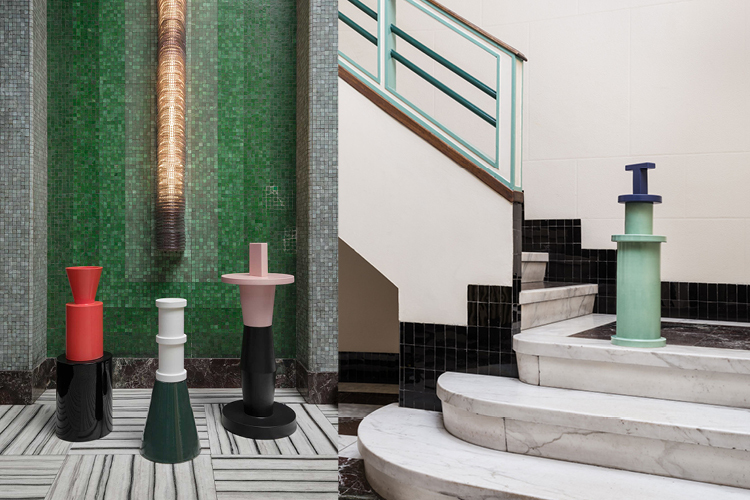 Florentine ceramics brand Bitossi has teamed up with Nathalie du Pasquier to create seven vessels — one for each day of the week — that play with the idea of bold block colours and stoic shapes. 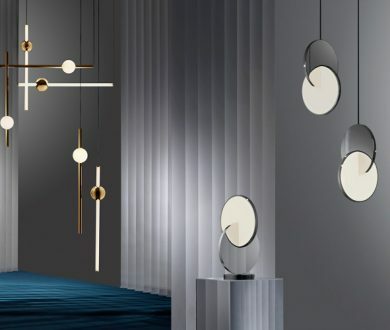 Teaming up with four designers to create experimental lighting pieces, Giopato & Coombes are pushing the creative boundaries of lighting as we know it, with these unique and eye-catching chandeliers. 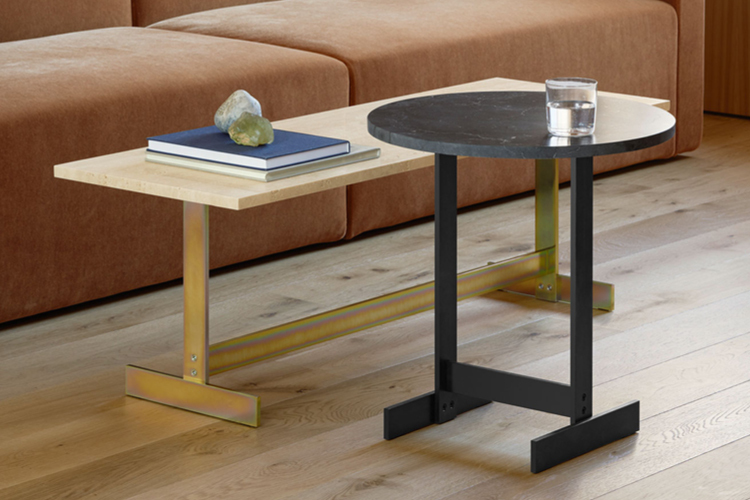 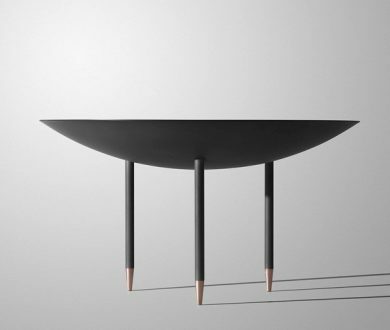 Sleek and functional, De Castelli’s new table is elevating indoor living with its minimalist aesthetic — imbuing any space with understated luxury. 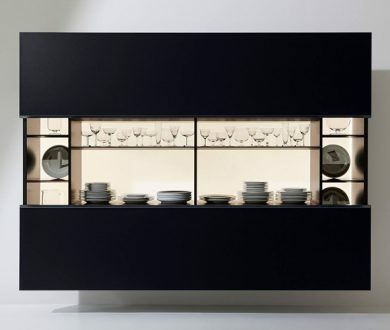 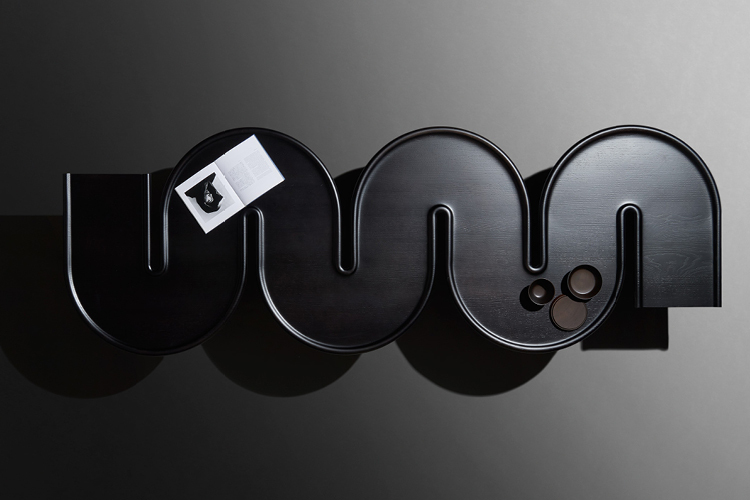 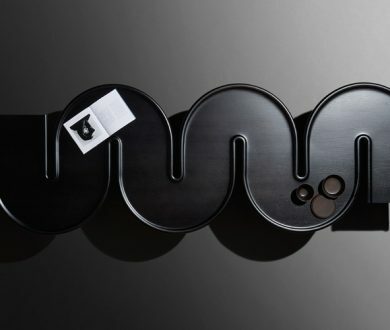 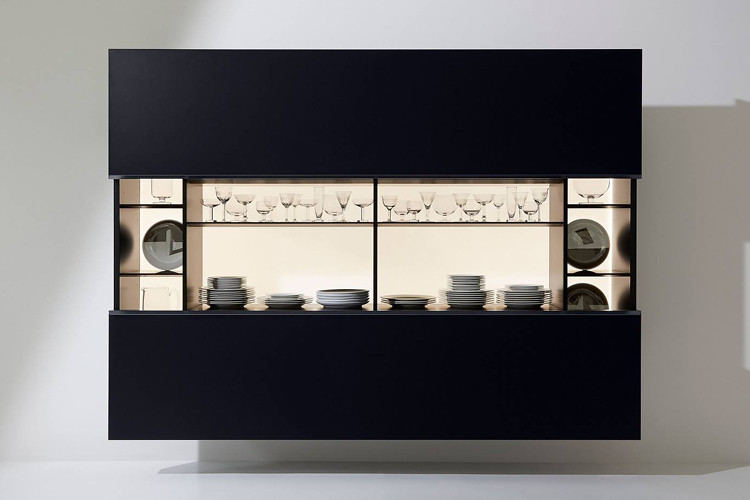 Ideal for storing valuable tableware and liquor, the appeal of Porro’s new and improved sideboard is the peculiar effect created by the mirror back panel that makes the internal matt lacquered shelves. 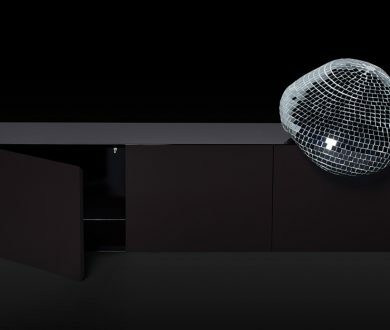 It is available in one of the 24 enticing colours. 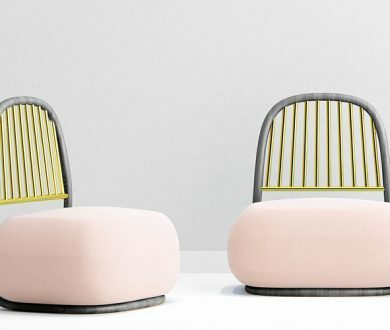 Dubbed ‘the classic shell chair for contemporary living’, AIIR is a versatile new chaise from the Copenhagen-based studio that can be used outside or in. 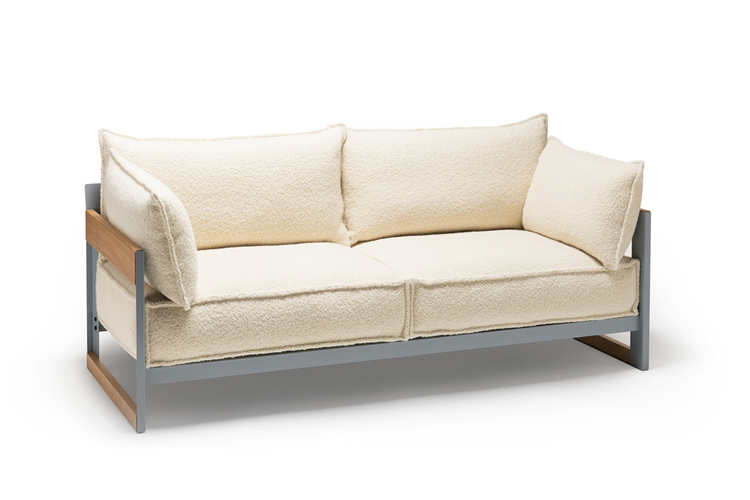 Lightweight and with teak tapered legs, the collection comes in an exclusive colour palette reflecting Nordic and Italian influences. 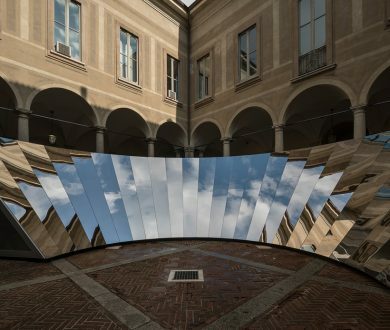 This mirrored installation is the result of a collaboration between COS and Phillip K Smith III. 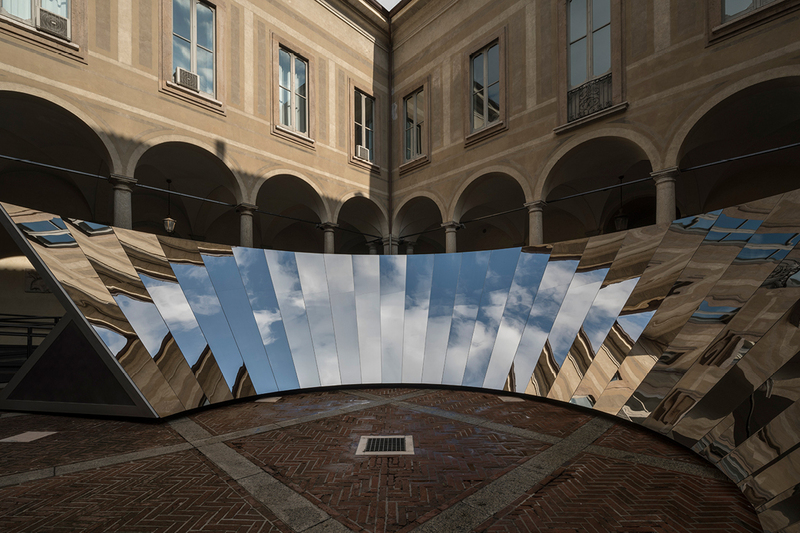 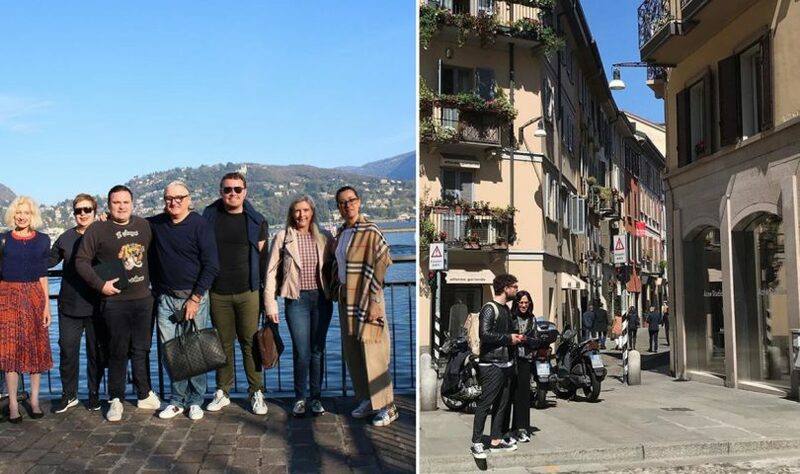 Constructed to mirror the surrounding renaissance architecture of the Palazzo Isimbardi and a 360-degree view of the sky, this breathtaking piece is making us pause for reflection. 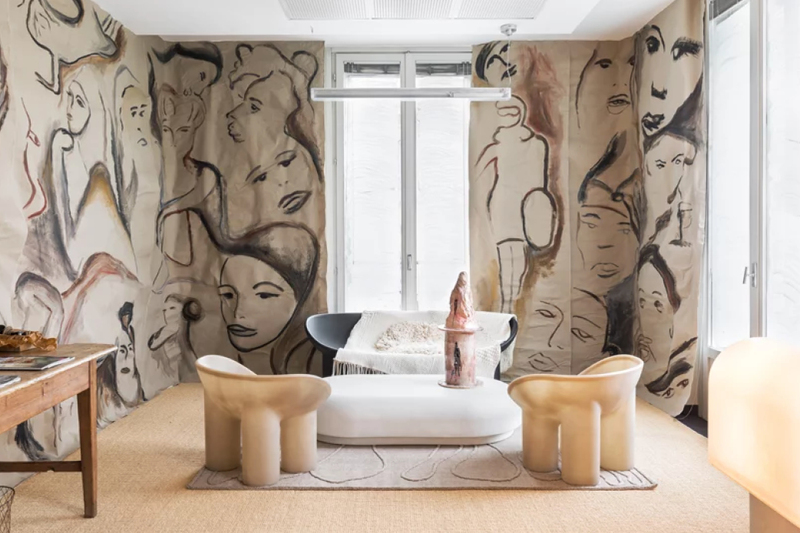 Commissioning a number of renowned, Italian designers to reimagine the contemporary working space, Vogue Italia lent its new offices to be overhauled for this exhibition. 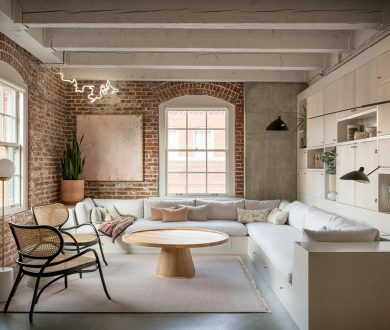 Designers took the editorial staff rooms and created spaces that reflected their own individual styles. 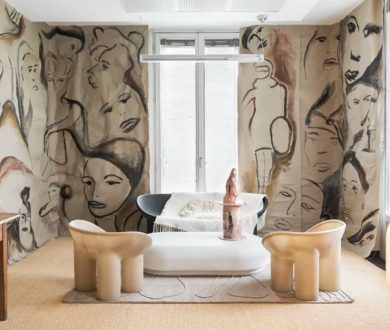 The architect behind the Fendi private suites in Rome, Marco Costanzi created an industrial style concept for the luxury brand, with a sleek, monotone finish. 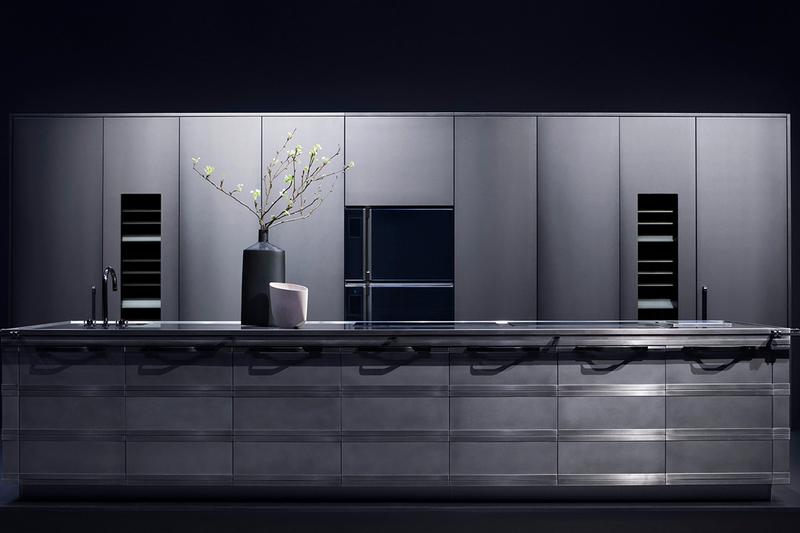 Using different textures to lend dimension, this dark and moody concept is the ultimate designer kitchen. 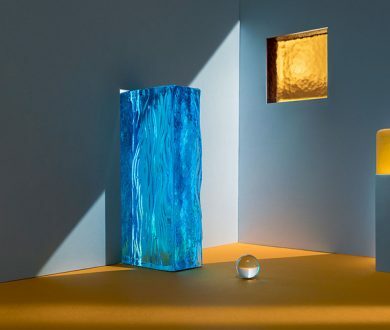 Teaming up to create an exhibition that explores the ideas of alchemy and decay, Lindsey Adelman and Calico Wallpaper created lighting and murals by harnessing the corrosive properties of salt. 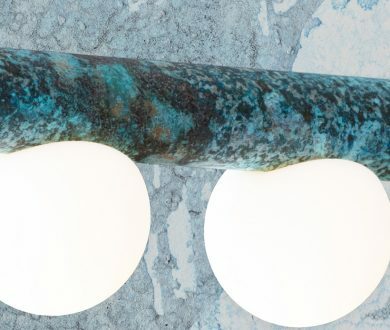 Conjuring images of the ocean with deep, mottled blues and crisp white accents, the exhibition is a visual feast. 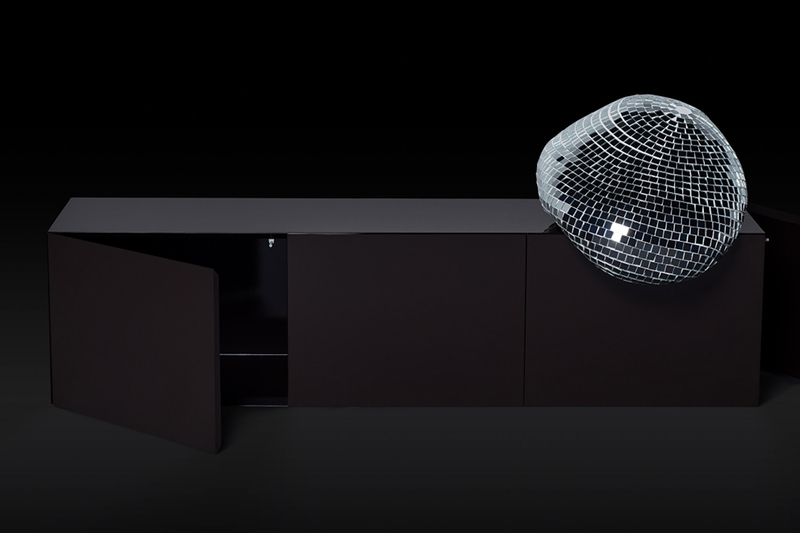 Italian brand Gurfam has presented a collection of discotheque-inspired carpets and furniture. 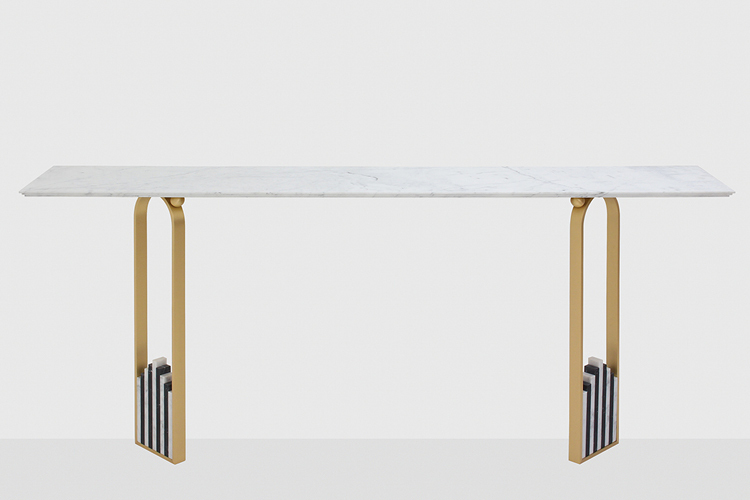 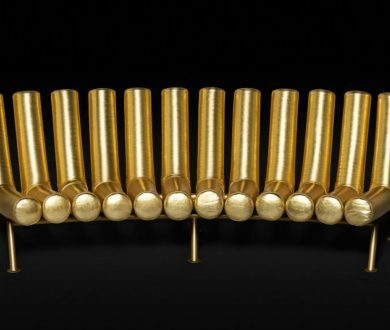 Drawing inspiration from the hedonism of Studio-54, the pieces are dynamic and geometric. 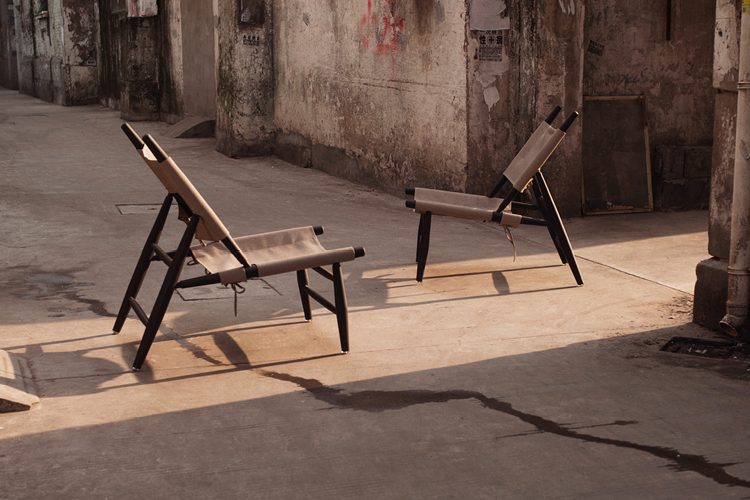 Continuing the revered trajectory of the Bitta collection, these pieces are updated for a new season, while retaining their form and rational concept.